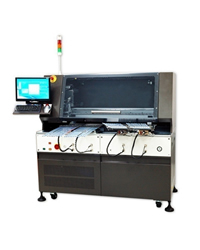 HL720 Automated Tube IC Lead / Mark Inspection System | FALCON DENSHI K.K. HL-720 system performs efficient and precised lead inspection, mark inspection and surface inspection with accurate 3D optical measurements for ICs in tube. System performs mark / surface scanning with Carried CCD on Tube In spots, then pick ICs, go through Fixed CCD for lead scanning and then place ICs on Tube Out spots. Pairs of Tube In and Tube Out move units in and out by turns to eliminate pick & place wait time as well as easy tube load / unload operation. System performs mark / surface scanning with Carried CCD on Tube In spots, then pick ICs, go through Fixed CCD for lead scanning and then place ICs on Tube Out spots with passes / failures sorted to individual tube category. Pairs of Tube In and Tube Out move units in and out by turns to eliminate pick & place wait time and easy tube load / unload operation as well. System provides 3D measurements of lead pitch, lead width, lead co-planarity, lead span, lead skew, terminal dimension, standoff …etc. for SOIC, SSOP, TSSOP… packages. Either single marking criteria can be set for all characters or 3 different criteria can be individually set for small, medium and large characters to screen out defects of double marking, low contrast marking, voids or bleeds in the mark, broken or smeared characters...etc. System also provides surface inspection to screen out body defects such as scratch, crack, chipout…etc. The 3DX, accommodated with 3 high resolution digital cameras plus working with powerful I-Cite vision software, provides the algorithms for high speed and accurate 3D image acquiring and processing. Sub-pixel algorithms maximize accuracy of measurements to 1/4 pixel. Serialized lead / mark scanning, up to 10 units each pick & place, visual scanning on the fly without having to stop and position as well as extremely high speed image processing contribute system throughput up to ~ 8K UPH for lead and mark inspections. System provides data collection report including yield summary, rejects summary and overall statistical summary with detailed CPK data for Process and QA engineering. Tube Out Two 12-tube-wide devices mounted. 10 tubes for passes, 2 tubes for lead / mark failures. Please feel free to contact us from the following form for more detail.